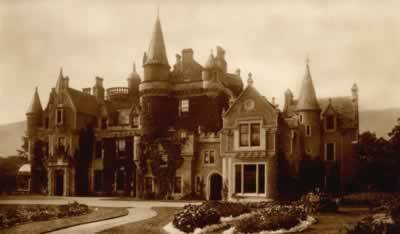 Aldourie Castle was originally an early 17th century stone mansion house, founded by the Dunbars. Possibly on the site of an earlier laird's house, a mansion consisting of a three storey main block with a round tower and parapet, was recorded here in 1626. A wing and turrets were added in 1850 and around 1900 Sir Robert Lorimer transformed the building into Scottish Baronial Gothic castle. 7 miles north-east is Inverness Castle and 16 miles north-east is Dalcross Castle. Aldourie Castle is located north of Dores, on the east shore of Loch Ness. 7 miles south-west of Inverness, on the B862. The castle is available on an exclusive use basis and also provides holiday cottage accommodation, check website for details. The site is visible from the A82, across Loch Ness at Lochend.